Wear OS 2.0 is Google's smartwatch operating system, and it powers a lot of the best smartwatches on the market. It represents a significant improvement over the older Android Wear operating system, and you can use it with both Android phones and iPhones. With the right tips and tricks, you can even accomplish some things, like listening to music, right on your smartwatch, without needing your phone at all. While Wear OS is pretty easy to use on a basic level, it has a lot of interesting features and options under the hood. So if you want to get the most out of your smartwatch, we've compiled a list of the 10 best tips and tricks for Wear OS. One of the best things about smartwatches is that you can customize the watch face. You aren't locked into a particular look, so you can prioritize any specific information or aesthetic style that you want. Basic watch faces just show the time, but you can get watch faces for Wear OS that display information about the weather, how many steps you've taken during the day, notes about upcoming appointments, and even your heart rate. Tap the watch face, and keep your finger pressed down until the watch vibrates. Swipe left and right to view the available watch faces. Tap a watch face to use it, or tap see more watch faces to see other available options. In addition to the faces that your smartwatch came with, you can also download new ones from Google Play. There are even Android apps that allow you to design your own watch face from scratch. When you turn on your smartwatch the very first time, you'll find that it comes with some basic apps pre-installed. These apps provide enough functionality to make the watch usable, but they really only scratch the surface of what a smartwatch can do. The two easiest ways to get new Wear OS apps on your watch are to download them directly from Google Play, or sideload them from your phone. There are other more complicated options, but you'll be able to get most of the apps you need through these two methods. Press the side button or the crown button, depending on the design of your watch. Navigate to the app you want, and tap Install. Magnifying glass icon: Tap this to search for a specific app. Recommended for you: This section includes popular apps that Google thinks you will enjoy. Watch faces we love: This is the easiest way to discover new watch faces. Featured apps: This section includes highly rated Wear OS apps that Google has chosen to promote. Essentials for Wear OS: Some of the most important Wear OS apps are included in this section. When you first get your smartwatch, you should check this out. Track your workout: If you want to use your smartwatch like a fitness band, you'll need the apps in this section. Streaming audio: Smartwatches can pair with Bluetooth headphones, so you can actually use them to stream audio like music and podcasts. This section includes some great apps to help with that. Get it done: Apps that are aimed at increasing your productivity can be found in this section. It's play time: There aren't a lot of games available for Wear OS 2.0, but you'll find most of the best ones in this section. Install an app on your phone that has a Wear OS 2.0 version or component. Tap the side button or crown button on your watch. Tap the app you want to sideload. Smartwatch screens are a whole lot smaller than phone screens, which makes it difficult to navigate especially long lists of installed apps. You'll find that apps temporarily move to the top of the list when you use them, which makes it easier to access anything you've used recently. If there are any apps that you know you'll be using on a regular basis, it's much more useful to pin them. Pinning an app on your smartwatch moves it to the top of the list permanently, so you'll never have to scroll through the whole list to find it. Tap the side button or crown button to open the app list. Locate the app you want to pin. Tap the icon, and hold your finger in place. The app will move to the top of the list, and a star will appear next to the icon. If you ever want to unpin an app, all you have to do is tap its icon and hold your finger in place. The app will return to its original place in the list, and the star will disappear. Wear OS comes with three default input methods: Google's basic Wear OS keyboard, handwriting, and voice. The basic keyboard is functional enough, but typing on such a small screen can be difficult (some characters are even left out of the main keyboard). If you want to try a different keyboard, you can. There are a bunch of free keyboards available on Google Play, and you can switch back and forth between them any time you like. From the main watch face, swipe down. Tap the gear icon > Personalization > Input methods > Manage keyboards. Select each keyboard you want to be able to use. Once you've completed those easy steps, your new keyboard, or keyboards, will be available. Whenever you use an app that requires a keyboard, press and hold the keyboard icon. That will bring up a list of your available keyboards. Select the one you want to use, and it will be the new default keyboard on your watch. If typing on a tiny watch screen isn't your thing, there are two ways to write messages and enter other text without using an on-screen keyboard. Wear OS 2.0 includes a built-in handwriting recognition feature, and it's also capable of transcribing spoken messages. Whenever you need to enter text into your smartwatch, it provides you with the option to choose your input method. When you see this choice, that's your opportunity to use the handwriting or transcription input methods. Launch any app that requires text input. When prompted to select an input method, tap and hold the keyboard icon. Tap the keyboard icon again. Use your finger to write on the touchscreen. The screen will scroll slowly to the left, allowing you to write entire words. When prompted to select an input method, tap the microphone icon. When you see speak now, say your message out loud. Your smartwatch will transcribe the message. If the message is correct, tap the check mark. Wear OS 2.0 understands voice commands, and you can use it with Google Assistant. You can even activate it with the "Okay, Google" phrase you use with Assistant on your phone, although enabling that particular feature can drain the battery in your smartwatch very quickly. Press and hold the side button or crown of your smartwatch. When you see the Google Assistant microphone icon appear, say a command or ask a question. Send text messages, initiate phone calls, and send messages using compatible apps like WhatsApp. Try these commands: Send a text, Call. Try these commands: Get directions, Is there traffic to work. Try these commands: What is my agenda today, set a reminder, set a timer. Try these commands: Track my run, what's my step count, what's my heart rate. To see a full list of available commands, ask Google Assistant what it can do, scroll to the bottom of the list, and select see more you can do. From the main Google Assistant screen, you can also access a limited number of options by tapping the settings icon. If you want to save battery power, this is the menu where you can turn off Okay Google detection. Google Pay is a service that allows you to pay for things with an app on your phone. If your smartwatch supports it, you can leave your phone in your pocket and pay directly with your watch. This feature is only available on Android smartwatches that include a built-in near field communication (NFC) chip. If your watch is supported, it should already have Google Pay installed when you buy it. However, Google Pay is only available in the United States, UK, Italy, Spain, Australia, Canada, Poland, Russia, and Germany. Open Google Pay on your phone. Follow the on-screen instructions to add a card. If you have a card on your phone already, you will need to re-add it to your watch. Once you have completed the process, the card will be available. Open Google Pay on your watch. Hold your watch over the payment terminal. When you feel your watch vibrate, or hear it make a sound, check the screen. If asked to choose between credit and debit, choose credit. 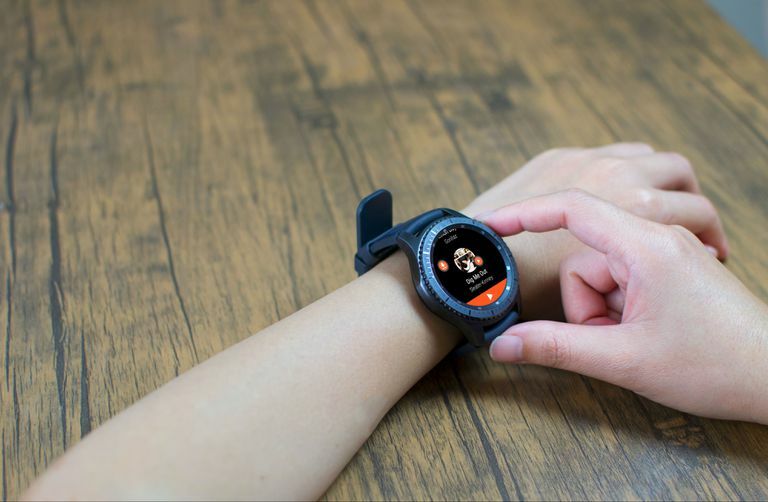 With Wear OS 2.0, you can listen to music right on your smartwatch. Most smartwatches have built-in speakers, with varying levels of quality from one device to the next, but you can also pair Bluetooth headphones or earbuds. If you use the Google Play Music app to download songs directly to your phone, and pair a set of earbuds, you can leave your phone at home when you head out on a jog, and still listen to music. Open Google Play Music on your watch. Scroll down and select My Library. Tap the download icon next to the album you want to listen to offline. After you've selected some albums to download, return to the main Google Play Music screen. Scroll to the bottom, and select show downloaded only. You can now use your smartwatch to listen to music without your phone. If you subscribe to Google Play Music All Access, you can download any album you want from the service. If you don't, then you can only download music that you uploaded to the service yourself. Having notifications from your phone displayed right on your watch is extremely convenient, but it can also create a nuisance and even drain your battery. If you only want to receive important notifications on your watch, like emails and text messages, you can block notifications from specific apps. Open Wear OS on your phone. Scroll down to the Setting section. Select the apps you want to receive notifications from. Smartwatches are better than regular watches in almost every respect, but they fall flat in the department of battery life. Even the best smartwatches, with the most powerful batteries, can't compare to traditional watches in terms of battery life, because they just take so much more power to run. If you're having trouble with battery life in your Android smartwatch, the first thing you should do is fully drain the battery, then fully charge it, then fully drain it again. Going through several of these full discharge cycles can drastically improve battery life, especially if your watch had battery problems from the moment you bought it. Try a different watch face: Some watch faces have a lot more going on than others, and that extra information and activity comes with a cost in terms of battery use. Switch to a more basic watch face for a day, and see if that helps. Disable the always-on screen: Having your watch face visible at all times is cool, but some smartwatches just can't handle the battery drain. To turn off this feature, you need to swipe down, tap the gear icon, tap display, then tap always-on screen. Turn off tilt-to-wake: This is a cool feature, because it allows you to check your watch at any time by just flipping your wrist. The watch can turn on when you don't want it to as well though, which can drain battery. To disable this feature, you need to swipe down, tap the gear icon, tap gestures, then tap tilt-to-wake. Shut the screen off manually: When you're done looking at your watch, place your palm against the watch face. You'll feel the watch vibrate, and the screen will shut off. Lower the screen brightness: Try setting the screen brightness to the lowest level that still allows you to read the watch, and adjust it up from there as needed. To adjust brightness, swipe down and then tap the sun icon. Disable unnecessary notifications: Every time your phone pushes a notification to your watch, it uses up some battery power. Turn off the notifications you don't need to save power. Uninstall unnecessary apps: If you notice sudden power drain after installing an app, try uninstalling the app temporarily. If that fixes your power woes, then it's a safe bet that the app is doing something that's sucking your battery dry. Either leave the app uninstalled, or contact the developer of the app for help.